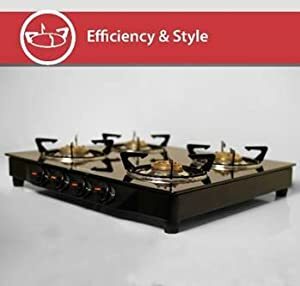 Buy Lifelong Glass Top Gas Stove, 4 Burner Gas Stove, Black (1 year warranty with Doorstep Service) @ 60% Discount. The Lifelong 4 burner gas stove is designed to fulfill your needs both in terms of efficiency as well as style. All parts of the gas stove are heat resistant and can withstand high temperatures on a daily basis. 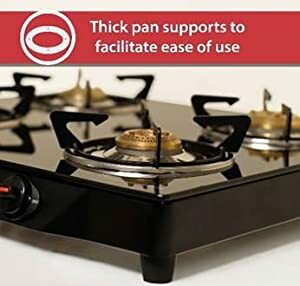 Although the gas stove is quite compact, there is enough space for you to use larger dishes at the same time without the fear of dis-balancing or crowding. The even distribution of the flame across all 4 burners gives an even flame under the utensil, ensuring a perfect cooking experience and optimum fuel utilization every time. Nylon coated knobs, anti skid feet, 4 highly efficient burners. The Lifelong 4 burner stove is designed for optimized fuel usage and maximum kitchen efficiency. The 4 burners make it easy to cook separate dishes in a lesser span of time, for more efficiency and lesser time in the kitchen every day. 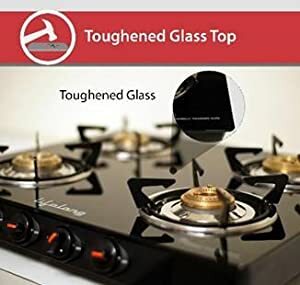 The top of the Lifelong 4 burner gas stove is covered with a layer of shatterproof glass, toughened glass which gives your kitchen a touch of elegance and a premium feel. The glass is heat resistant and can withstand high temperatures on a daily basis. 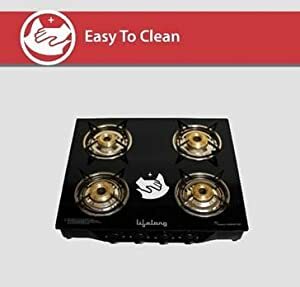 The 4 burner pans and nylon coated knobs of the Lifelong 4 burner gas stove can withstand high temperatures on a daily basis. The glass top is shatterproof and does not chip or crack when faced with extreme heat. All these features, combined with the anti skid feet, ensure risks like burning and dis-balancing are minimized. For most kitchen appliances, cleaning up after using them is one of the most tedious tasks. Not so with the Lifelong 4 burner stove. The shatterproof glass top can easily be cleaned using a wet cloth, and even the sides and the knobs can be cleaned with ease. This helps to maintain a clean atmosphere in your kitchen. While cooking, stirring and frying often require you to apply pressure on the dish and the stove. 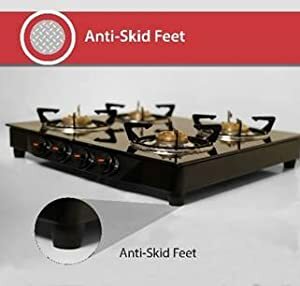 This might make the stove skid and the hot food might fall on you causing burns. The Lifelong 4 burner gas stove is designed with anti skid feet to ensure minimization of such risks while working. 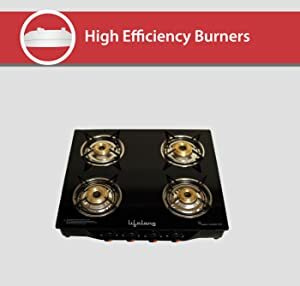 Lifelong gas stove with four burners is a highly efficient stove. The glass top is toughened to be shatter-proof. It looks elegant and adds charm to your kitchen. The burner stands are designed to be spill-proof, so you don’t have to worry about your vessels toppling over. The knobs are ergonomically designed for ease-of-use. Moreover, they are engineered to avoid leakage of gas to give you safe and efficient cooking experience. The compact design of the stove saves you a lot of counter-top space.